"Trainers get certified. 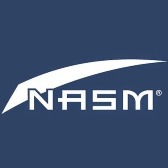 REAL trainers get NASM Certified." Since 1987, the National Academy of Sports Medicine (NASM) has been a global leader in providing evidence-based certifications and advanced credentials to health and fitness professionals. In addition to its evidence-based NCCA-accredited Certified Personal Trainer (CPT) certification, NASM also offers a progressive career track with access to advanced specializations in Sports Performance (PES) and Injury Prevention (CES), Continuing Education courses, and accredited Bachelor and Master Degree programs. The NASM educational continuum is designed to help today’s health and fitness professionals enhance their careers while empowering their clients to live healthier lives.